This rig can be used with a groundbait feeder, a blockend feeder or a straight lead, and it can be used with a very short hooklength or a really long one – the choice is yours. This rig is ideal as it allows the angler to swap and change the weight, style of type of leger/feeder being used in seconds. You simply unclip the Feedabead or snap link swivel and swap the feeder/leger over. This is handy if you need extra weight to cast through a wind. Maybe you’ve fed enough and want to switch to a smaller feeder. Or perhaps you want to search the water for signs of fish and wish to switch to a straight lead – you can do it all with this rig. 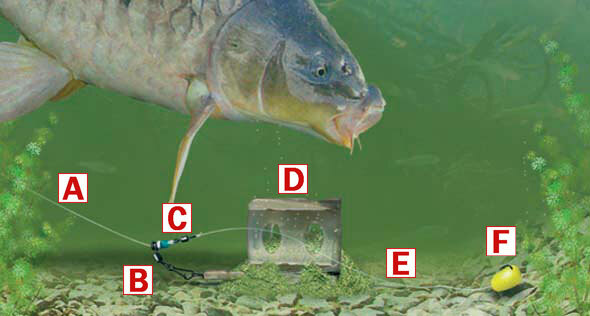 A Your mainline needs to be strong enough to cope with the fish you are likely to catch. An average day on an average stillwater will require 4-6lb line. B Thread a Korum Feedabead or snap link swivel onto your mainline and follow this with a small bead. C Now securely tie on a micro swivel. Micro swivels are tiny and therefore they weigh very little, so a fish that takes the bait won’t be able to feel the weight of this tiny swivel. D Clip your chosen weight onto the Feedabead or snap link swivel. It could be a groundbait feeder, a blockend feeder or a straight lead. E Your hooklength choice will again depend upon the size of fish present in the venue. The best hooklengths are high-tech lines as these offer great strength for a reduced diameter, meaning you’ll get more bites and stand a better chance of landing the fish you hook. A good starting point for general fishing will be 0.10mm, but step up to something like 0.16mm if you are hitting into lots of big carp. F Your hook needs to match the size of your chosen bait.